Silly old fox/owl/snake, doesn't he know? After getting rid of the last animal, the mouse is shocked to encounter a real gruffalo – with all the frightening features the mouse thought that he was inventing. The gruffalo threatens to eat the mouse, but again the mouse is cunning: he tells the gruffalo that he, the mouse, is the scariest animal in the forest. Laughing, the gruffalo agrees to follow the mouse as he demonstrates how feared he is. The two walk through the forest, encountering in turn the animals that had earlier menaced the mouse. Each is terrified by the sight of the pair and runs off – and each time the gruffalo becomes more impressed with the mouse's apparent toughness. Exploiting this, the mouse threatens to eat the gruffalo, which flees. The story is based on a Chinese folk tale of a fox that borrows the terror of a tiger. Donaldson was unable to think of rhymes for "tiger" so instead she invented a word that rhymes with "know". It all began when Julia Donaldson came across a Chinese tale about a clever girl who tricks a hungry tiger into believing she is the Queen of the Jungle and scares him away. Julia thought this would make the basis for a good picture book story, but couldn’t think of anything to rhyme with ‘tiger’ – so she created her own monster whose name had to end in O, to rhyme with ‘doesn’t he know’. In fact, if you’ve ever wondered why the Gruffalo looks the way he does, that also has a lot to do with things that just happened to rhyme, like toes and nose, and black and back. But of course the Gruffalo as we know him didn’t come fully to life until Axel Scheffler picked up his pencil and drew him. He might have looked quite different; at first, Axel sketched out a monster who was even more frightening than the one we know! He also thought about making the animals wear clothes, but in the end this didn’t happen, perhaps to Axel’s relief: imagine trying to dress a snake! The Gruffalo, The Gruffalo’s Child was introduced to the world, starring in her very own adventure – and proved an instant hit. It was voted The Children’s Book of the Year at the British Book of the Year Awards in 2005. The Gruffalo, too, has won many awards, including the Nestlé Smarties Prize and the Blue Peter Award for The Best Book to Read Aloud – and in 2009 was voted the UK’s favourite bedtime story. 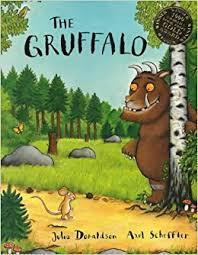 But Gruffalo fans are everywhere: the story has been translated into over fifty languages, including Thai, Russian, Scots and Maori . . . and for Classics scholars, there is even a Latin edition. The story introduces three male goats, sometimes identified as a youngster, father and grandfather, but more often described as brothers. In other adaptations, there is a baby or child goat, mama goat and papa goat. "Gruff" was used as their family name in the earliest English translation, by Dasent; the original Norwegian version used the name "Bruse". In the story, there is almost no grass left for them to eat near where they live, so they must cross a river to get to "sæter" (a meadow) or hillside on the other side of a stream in order to eat and fatten themselves up. To do so, however, they must first cross a bridge, under which lives a fearsome and hideous troll, who is so territorial that he eats anyone who tries to cross the bridge. The smallest billy goat is the first to cross and is stopped abruptly by the troll who threatens to "gobble him up!" However, the little goat convinces the troll to wait for his big brother to come across, because he is larger and would make for a more gratifying feast. The greedy troll agrees and lets the smallest goat cross. The medium-sized goat passes next. He is more cautious than his brother, but is also stopped by the troll and given the same threat. The second billy goat is allowed to cross as well after he tells the troll to wait for the biggest billy goat because he is the largest of the three. The third billy goat then gets on the bridge and is stopped by the hungry troll who threatens to devour him. However, the third billy goat challenges the troll and knocks him off the bridge with his horns. The troll falls into the stream and is carried away by the current. From then on the bridge is safe, and all three goats are able to go to the rich fields around the summer farm in the hills, and they all live happily ever after. Once upon a time there were three Billy Goats Gruff; Little Billy Goat, Middle Sized Billy Goat and Great Big Billy Goat, who lived in a field in a green valley. They loved to eat sweet grass, but sadly their field was now brown and barren because they were greedy goats and they’d eaten every last blade of grass. But they were still hungry. In the distance they could see a field that was full of lush sweet scrummy grass, but alas there was only one way to get to it – over a rickety bridge over a stream. But under the bridge lived a terrifically terrifying terrible troll called Trevor – he was always hungry too. And there was nothing he liked better than to eat a nice juicy Billy Goat. The Little Billy Goat was the first to reach the bridge. Gingerly he put one hoof and then another onto the bridge but because it was so rickety, however hard he tried, his hoof still went trip trap, trip trap on the wooden planks. So the greedy Troll decided to wait and Little Billy Goat Gruff skipped over the bridge and began to eat the fresh green grass on the other side. The other goats saw Little Billy Goat Gruff eating the fresh green grass and were jealous because they wanted some too. So Middle Sized Billy Goat Gruff went down to the bridge and began to cross the stream. Trip, trap, trip, trap went his middle sized hooves. Again the Troll loomed out from under the bridge. ‘Who’s that trip trapping over my bridge?’ he roared. ‘Oh all right’ said the Troll and Middle Sized Billy Goat Gruff scampered over the bridge and began to eat the sweet green grass with Little Billy Goat Gruff. Big bold Billy Goat Gruff was jealous and couldn’t wait to get across the bridge and join his brothers. So boldly, he put his hooves onto the bridge. Trip, trap, trip, trap. Suddenly the Troll loomed out from under the bridge. ‘Who’s that trip trapping over my bridge?’ he boomed. Then the Troll rushed at Big Billy Goat Gruff who bent his head and bravely charged at the Troll, catching him up in his horns and tossing him into the stream below. The Troll disappeared under the rushing water, never to be seen again. 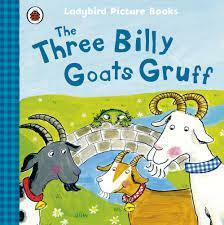 From then on, anyone could cross the bridge and enjoy the sweet green grass with the Three Billy Goats Gruff.